I never met Margo Carter, or at least I don't think I did. She took up residence in the Tiger Leaping Gorge in the mid 1990s, whereas my one and only visit to this scenic wonder of the world was in 1994, presumably before she arrived. I am glad I visited when I did, before the road was put through and it became a must-do feature in the Lonely Planet guidebook for China. From what I gather, Margo was a bit of an eccentric character, who hailed from Bendigo in Victoria and who had worked in market research and as a teacher in Sydney before travelling in China. 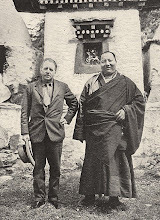 She obviously was drawn to the scenic splendour of the Tiger Leaping Gorge and the charms of the local area, because she settled down to live there, and set up home with a local ethnic Tibetan guy, Sean, aka Xia Shan Quan, in 1996. Sean had already set up one of the pioneering guesthouses in the gorge, at Walnut Grove, and was considered to be a pro-environmental kind of guy. His main guesthouse competitor, 'Woody', seemed to be more of an entrepreneur. Margo did what I and I guess many other people have often dreamed of - dropping out and opting to live in a place far removed from civilisation in a remote part of Yunnan. No roads (at least to start with), no shops, no TV and little electricity. Not even a flushing toilet. In reality, it can hardly have been a quiet life. With a steady flow of western backpackers traipsing through the gorge, Margo must have been busy trying to encourage them to stay at the guesthouse she ran at the entrance and at Sean's at Walnut Grove. Reports from traveller's blogs and the various online travel forums suggest she was a bit of a Jekyll and Hyde character. Some describe her as a wonderful host, welcoming and very helpful, going out of her way to guide people along the gorge and help them avoid being ripped off by some of the more dodgy operators along the way. Other accounts describe her in varying degrees as aggressive and abrasive or just 'crazy', while some vistors found her withdrawn and dismissive. I guess it can be hard trying to put on a welcoming face to show to the world as it tramps through your home every day, but even so, it sounds like Margo was sometimes exhibiting a TLG version of 'cabin fever'. She married Sean, and his website says he has three daughters, though I can't imagine what it would be like for a westerner rearing children in such basic conditions. Apparently Margo later split up with Sean, and some reports say Sean went to the US for a while, and yet recently they appear to have been back in business together, running their guesthouses and guided treks in the gorge. Living in the Tiger Leaping Gorge for the last 15 years, Margo must have witnessed some profound changes and experienced a lot of dramas in her time. What started off as a single precarious mule trail through the gorge explored by a trickle of adventurous backpackers was gradually but relentlessly transformed in the 1990s. Dynamite blasting created a 'scenic highway' through the gorge that carried convoys of tour buses full of Chinese day trippers, down from the tourist boomtown of Lijiang. There were still plenty of western backpackers doing the 'higher' footpath trail, however, and Margo must have dealt with a fair few of the reported incidents of westerners injuring themselves or being killed by falls in the gorge, or being attacked or in some cases just disappearing along the track and being searched for by fraught relatives. Margo featured in many a travelogue and TV show, was mentioned in the Lonely Planet guide. Like the eccentric Dr Ho running his herbal tea clinic outside Lijiang, Margo became one of the local characters. She was also frequently interviewed by western journalists about the likely future of the gorge after it was rumoured that it would be the site of a massive dam to tap the hydro potential of the Yangtze at one of its narrowest points. Was she happy there? Well, aside from the reports of her occasionally cranky character, one of the last journalists to have interviewed her in recent times (a reporter from the Financial Times re-visiting the gorge to see how it had changed) reported that she seemed disillusioned by all the development and commercial exploitation going on in the gorge. It must be heartbreaking to settle in such a beautiful wilderness and see it slowly transformed into an overdeveloped tourist trap. A few weeks ago I heard from a friend who lives in Yunnan that Margo had died. No details. I was vaguely curious, but thought little more about it as I was so busy with work and family matters. 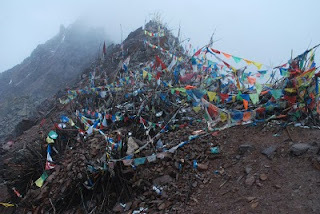 Then in recent weeks, as I was planning to do another trek in South West China, I came across the bizarre details of what apparently happened to Margo, and how she died while doing a solo trek far away from the gorge, around the holy mountain of Kawa Karpo (Meili Xueshan) in the Deqin region of far north west Yunnan. I had been considering doing this 'big' kora (circuit) trek myself, but gave up on the idea after reading a few accounts of how strenuous it was - a full-on, 10-day trek from the Mekong (Lancang Jiang) over the high mountain pass of the Doker-La to the Salween (Nujiang) and back over a more northerly pass, the Shu-La, again to return to the Mekong. 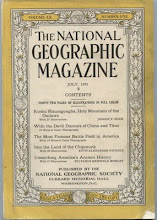 (This is the Joseph Rock connection - his account of an extended trip along this route appears in his article 'Through the Great River Trenches of Asia' in the August 1926 issue of National Geographic). I'd already done some sections of this trek, and found them tough, and I passed on the idea, partly because I lacked the time, but also because I considered the scenery not perhaps as good 'value for money' as that to be experienced in the Yading area, although it certainly is spectacular. I got much of my information from a website set up by a Yunnan-based British trekking guide called Richard Scotford, who used to run a trekkers lodge in Deqin. In an article Death on The Kora, Richard describes a strange encounter he had with Margo while he was leading a group of trekkers over the Doker-La pass on the first leg of the Kawa Karpo kora in October 2009. His group were surprised - to say the least - to be passed by a lone western woman traveling at speed (alone, that is, except for her dog and a local guide with a horse, left trailing well to the rear) and they noted that she was only lightly clad for the trail. Not only that, but they were taken aback by how rude she was to the trekking group, refusing to talk with them at all during their brief encounter on the trail. Things got stranger later in the day when they saw her again and she chose to camp alongside them, but again was uncommunicative. That was until she started saying that she would 'turn them in' to the local authorities and warning them that they would be turned back at local police checkpoints further up the Salween (Nujiang) valley and the local Tibetans would shun them. The group were un-nerved by her unfriendly and bizarre behaviour (she would only talk to them in Chinese at one point) and her apparent threats. Margo left early the next day and they never saw her again. In fact, they were some of the last people to see her alive. Richard is an experienced trekker in the region and he thought the claims that Margo made to them about the authorities were implausible and hard to believe. He was proved right. There were no roadblocks, and after some cautious checking, his group continued on uneventfully into the Salween valley, where the local Tibetans were friendly and helpful, and soon the trekkers had put the memory of this odd encounter with the 'mad' western woman out of their minds. However, a few days later when they came to do the strenuous return leg of their kora, back over the high passes to the Mekong valley in the east, they got a shock. After the exhausting climb up to the exposed Shu-La pass, they descended on the eastern side to find Margo's guide waiting at the first small settlement high up on the mountain. He was frantic and said he had not seen Margo for two days. She had gone missing at some point after leaving the guide behind when she hurried along in front to attempt the pass by herself. The guide had assumed she had gone on ahead, and he summmitted the pass and continued on down in the expectation of catching up with her on the other side. By the time the trekking group arrived he had already been waiting for her for two days. Richard later came to believe that Margo had taking a wrong turning at the confusing terrain of the Shu-La pass, where with three valleys to choose from it would be an easy navigation error to make. This would have seen her descending into a wrong 'dead end' valley and ending up be-nighted high on the mountain with no shelter and no warm clothes, no food and no means to make a fire. He doubted anyone could survive two nights out in the frigid high alpine environment. Not knowing where the strange western woman might be, the trekkers continued on down. Richard then goes on to explain some of the rumours they heard once they completed their trek. Some rumours coming out of the Tiger Leaping Gorge said that Margo had been murdered by a local trader after a deal to buy some of the expensive and highly-prized local medicinal mushrooms had gone sour. Richard rightly points out that this scenario seems improbable, given the remote and inconvenient location of her disappearance. After an extensive search by local residents and police, Margo's body was eventually found several weeks later on a remote trail at a large tree near the Shuo-La pass. Her small dog was also with her and was still alive. It appears likely that she simply underestimated the harsh conditions of the trek and the difficulty of the terrain that she would encounter. 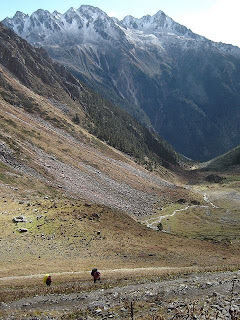 As another very experienced Australian trekker, Clem Lindenmayer, had discovered a couple of years earlier on the Minya Konka kora in Sichuan, solo trekking in Kham can easily be fatal. While Margo Carter was well known as a guide on the Tiger Leaping Gorge, the conditions on the Kawa Karpo kora are a whole world away and require a much higher level of trekking skills and experience. So was Margo just an unfortunate victim of misplaced over-confidence on a tough alpine trek? If so, why was she so hostile to the western trekkers she encountered on the way? Richard also mentions that Margo was seen by some other westerners in Zhongdian shortly before she started her trek, and she had advised them to listen out for 'some big news' from the kora at the time of her trek. What does this mean? Did she intend to walk off into the wilderness and do an 'Into the Wild' or something dramatic? Whatever the truth, it's a baffling and sad end for an eccentric character who 'lived out the dream' in one of the world's most remote and alluring locations. UPDATE OCT 2014: I have just done the Shu-La pass and am more mystified than ever about the disappearance/death of Margo. The route is quite clear all the way to the pass, and it would be hard to get lost unless you purposely went "off piste". The trek over the pass is strenuous, but not impossibly so. It would even be possible to cross the pass in 'ordinary clothes' as many Tibetans do, weather permitting. I'm also puzzled by the claim that her body was found by "a large tree" near the pass. As you can see, there are no trees whatsover within about a mile of the pass. Perhaps they meant much further down. The approach to the pass from the Wichu valley is through a wooded gully and is very strenuous/tedious (see my blog about the crossing here). There are also trees much further down on the eastern Yunnan side of the pass, but there is also a shelter at the treeline. Here's a pic of some mums and infants in light clothing, just after crossing the Shola Pass with me in October 2014. UPDATE April 2017: As you may have seen I made a return to the Shola last autumn and in con to my first crossing the weather was pretty bad. It was freezing cold and the low cloud/mist meant visibility was poor. I can now see how easy it would be to get disoriented and lost crossing the pass, and how quickly you could sucuumb to cold if not properly equipped. I met Margo a couple of times, most recently in July '08. She was helpful on that occasion, although a some years earlier I saw the other side of her character when she was giving an unnecessarily hard time to one of Sean's daughters. Very sad. Two years ago, I was part of an Intrepid group that had hired her to guide us through the gorge, not that a guide was really necessary. But we found her to be very kind and friendly and caring. I remember her kindness and quirky spirit. She was with the dog shown in the photo; the dog was just about to give birth, but walked with us anyway. I also met this woman about two years ago while trekking through the gorge (there was also an Intrepid group there at the same time). Quite a bizarre person, but characteristic of a foreigner who had been living in the sticks of China far, far too long. I met her in 2001 and after initial coolness there was scene like out of the Men at Work song - she just smiled and gave me a vegemite sandwich. A brief encounter, but I never forgot her. Her mood swings can be caused by a bipolar disorder. ALoha Michael -- Thanks for visiting TAO 61. Glad you enjoyed TKT, and I recomemend his other earlier book, Through China's Wall, too. I really would have liked to know this guy. I met Margo fairly early on after she decided to stay in China. She was prone to some pretty extreme mood swings even back then. But ultimately this story has little to do with her eccentricities and is about someone overestimating their abilities and not being safe in an extreme environment. I met Margo in July of '09. I was still knocking the rust of my Chinese and a bit uncomfortable when I got off the bus in Qiaotou. She was so kind and helpful to my wife and I. One example, Margo overheard my wife regretfully complaining she had left her favorite water bottle on the bus that brought us there. When we returned to pick up our bags a few days later, Margo had tracked down the bus and found her water bottle! Sweet lady and I'm sad to hear of her death. When my daughter Suzanne & I started the trek from Qiaotou in March 2008, we had been strongly advised to talk to Margo first before setting out uninstructed. We found her at her shop/café, which was filling with people when we arrived on the bus. Yes, she did make an eccentric impression and she held strong views on a number of subjects, which she did not hesitate to share with us. Fortunately, she took to us and briefed us on the dangers lurking ahead, although she was quite busy. Most of her information was essential for our trip (except her idea that we could make it to Tina’s before nightfall when it was already past 2 in the afternoon, in March – we managed Tea Horse by the skin of our teeth). 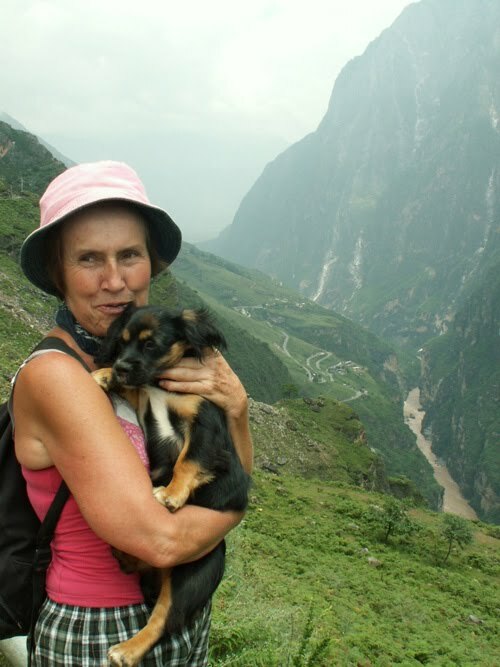 Her passing is a sad moment for the Tiger Leaping Gorge and it is a great loss for future hikers on the trail that Margo will not be there any more to help them on their ways. very sad but profound story of a passionate and perhaps eccentric woman who loved beautiful and remote place. Would love to visit the place myself. 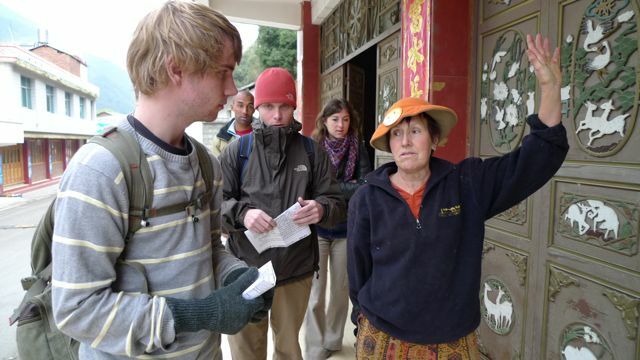 I worked as a tour leader in China and visited TLG 14 times in the tourist seasons of 07-thru 09. 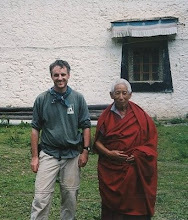 I always employed Margo as our guide because she understood westerners and had an intimate knowledge of local customs. She became a close friend over this time, and I always looked forward to my TLG trips; not only to see some of the most stunning scenery in China, but also to catch up with a good friend. The last time I visited was Oct 2009, when I was travelling independently and looking forward to a G&T with Margo at Sean's. Sadly she was gone. Crazy? no. A little eccentric, yeah ok. Margo Carter had a heart as big as a whale. And a passion for the gorge that made one never want to leave. I love the place. I'll miss you Margo - Tiger Leaping Gorge will never be the same again. I doubt that she would want to go any other way. Kawagebo is a beautiful place to lay at rest. Hi, this is Richard Scotford, referenced in this piece. The whole event was surreal for all of us on the Kora at that time. Rumours were wild after she disappeared that she was going there to die and she knew it, or she was doing a dodgy deal with some Tibetans mushroom dealers who killed her. In reality, just like this piece retells, we believe she just underestimated the Kora. Every time we saw her she was running with only a small pack and light clothing well ahead of her Tibetan support crew. Where she disappeared is a very confusing piece of trail, unlike most of the rest of the Kora, so taking a wrong turn, in bad weather with no equipment could quickly turn into a disaster. Sho La is not the 27 Bends at Tiger Leaping Gorge! Thanks for your comment/clarification Richard. Having just done the first half of the kora I imagine it would be possible for people to be fooled into thinking you could do it 'lightweight' and unguided in good conditions and in the popular pilgrim season. For the first half of the kora the trail is mostly quite clear and there are other pilgrims en route to guide you - not to mention the frequent rest stations/stores. However, my trekking partners who continued to complete the full kora said it was very different on the Sho La section, with few other pilgrims and an uncertain trail. I can easily see how a wrong turning could be disastrous, especially if the weather deteriorates. Even fully equipped were were freezing cold down at the lower levels of the trek. Can't imagine you could survive even one night out high up in poor weather. Well done ! You are so brave and adventurous! These are great pictures of the Tiger Leaping Gorge. Which reminds me... I should go through my India pictures and post some. Having read this I thought it was rather informative. I appreciate you finding the time and energy to put this article together. I knew margo quite well after a few visits and can confirm what i was told by expats in dali. Margo was disabled with personality disorder. She was indeed a jeckle and hyde character. It is interesting that comments about Margo are still coming up, and I guess that is fair enough. I was Margo's university days partner/boyfriend from 1975-76 at Toad Hall, ANU, and visited her in Bendigo when she returned there to teach. We also reconnected briefly in the early 80's when she was doing market research work here in Sydney. I had been emailing her in China using her Gmail account, and there was no doubt she was having her ups and down with Shaun for reasons I've no intention of disclosing. It was some time after her death I found out about her passing, and it is very sad. I can confirm that in her younger days Margo was a wonderful woman but she had a definite dark side to her personality, which would probably these days be referred to as a personality disorder. I'm not surprised to hear her described as a Dr Jekyl/Mr Hyde type of personality as that is the ways she was, 95% fantastic person but 5% borderline psychotic. It's been interesting reading about her here, RIP Margo, you were doubtless a colourful personality. Thanks for your comment Wabster. It's a very sad and mysterious incident. 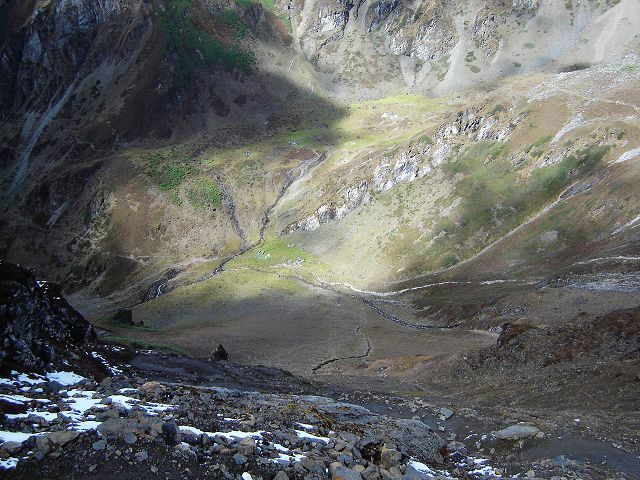 Having walked the kora I can see how dangerous the pass would be in bad weather, but I'm also baffled as to how anyone would get lost given the track is so well marked and there are so many Tibetans walking it. Fascinating stories indeed. All i can say is that i met her 5 times on visits to the gorge. The first four times were great with her being charming at all times. Sadly the last time she was manipulating and showed signs of two personalities which explained all the things I had seen in previous visits but did not pick up on. She was indeed the worst Jeckyl and Hyde person i had ever met in the end. Back to the gorge in 2013 and I found out about her death which Sean seemed still disturbed about and would not talk about it at all even though I knew him well. Back in Dali i talked to another ex pat i knew well who knew Margo well also. She had no doubt she had severe personality problems. I agreed with her 100%. She turned out to be one of the most manipulating people I had ever met and I realized she had been the same from my first visit although i didn't pick up on it until the last visit. She was also trying to write a book on Joseph Rock. A sad story whatever happened though. Thanks Nik. I recently made another trip to the Shola pass, this time the weather was pretty bad. In those windy, rainy and misty conditions it would be very easy to get lost & develop hypothermia very quickly. Not something to do solo or poorly equipped. And it's a very long walk down to anywhere even vaguely inhabited. A drip I went to Margo's place where she very kindly nursed me back to health. We even watched Gosford Park together! Fond memories of an odd but kind lady. It is interesting to see the comments about Margo still coming up. As I said earlier I was her b/f in our Canberra ANU University days in the 70's and we reconnected in the 80's as friends here in Sydney. I was only talking about her recently when a mutual friend from the ANU days, Phil Mott, died of cancer, and people remember her almost universally as a wonderful warm woman who had a bi-polar disorder at least. I too would be interested to see any more detail that might exist about the circumstances of her death, and particularly anything Sean might be able to add to the information already out there.